Tag Archive | "stock crash"
Well, there ya go. We made it through October without a serious stock market crash. That’s good because October has secured a reputation as a bad month for US stocks. It has a black mark. It’s the only month since 1950, that has twice had double digit declines. The Dow dropped 21.67% in October 1987 and 16.79% in October 2008. Plus of course the worst stock crash of all began in October 1929. In other words October is a scary month because investors are more likely to stampede with a sudden double digit downturn. It’s the stampede that creates the serious cataclysmic drop. In terms of average return, October is not a bad month. It’s tied for the sixth best. Here are some statistics about the Dow Jones Industrial Average average return by month since 1950. 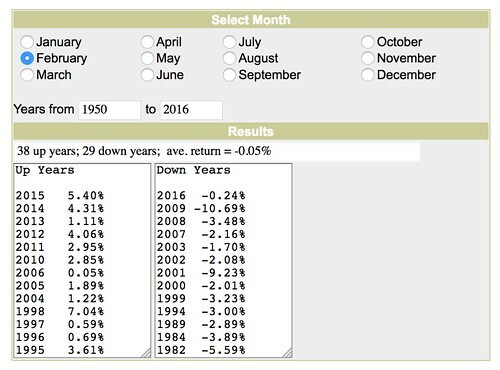 September is the worst month for returns in the US stock market, followed by August, June and February. November and December are the two best months of the year for the US stock market. If this type of stock history is of any value, then we should not expect and serious retraction in the stock market until at least February. Beware because markets are full of irony! Won’t it be if a share crash comes along during these next best two months? We won’t know till we know. So we should always protect our investments. There is three realities we can derive from these statistics. 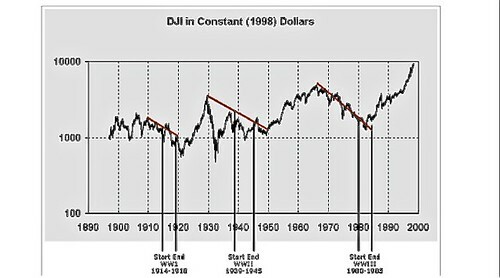 #1: Since 1950 the Dow Jones Average has risen an average of 6.87% per annum. #2: Since late 2008, the Dow Jones Average has risen almost 172% or 21.5% per annum. #3: Periods of high performance are followed by periods of low performance and vice versa. Warren Buffet once warned against the Cinderella effect. Cinderella may have lost a shoe when she fled the party to meet a midnight curfew. We can lose much more when we rush from a crashing stock market. Most investors face emotional dangers that build in rising markets. But the he clock of economic reckoning is ticking. No wants to see it. Nothing rises forever and especially… not everything at the same time. Yet no one wants to leave the party until the end. But many edge closer to the door. When the clock chimes there could be a stampede even though leaving in a hurry may be the worst way to go. Here are seven steps that can help avoid this risk. Choose investments based on markets instead of shares. Rely on financial information rather than economic news. Trade as little as possible. Make the decision process during panics automatic. One strategy is to invest in country ETFs that easily provide diversified, risk-controlled investments in countries with stock markets of good value. These ETFs provide an easy, simple and effective approach to zeroing in on value. Little management and less guesswork is required. The expense ratios for most ETFs are lower than those of the average mutual funds. Plus a single country ETF provides diversification equal to investing in dozens, even hundreds of shares. A minimum of knowledge, time, management or guesswork are required. Keeping investing simple is one of the most valuable, but least looked at, ways to avoid disaster. Simple and easy investing saves time. How much is your time worth? Simple investing costs less and avoids fast decisions during stressful times in complex situations where we are most likely to get it wrong. Fear, regret and greed are an investor’s chief problem. Human nature causes investors to sell winners too soon, and hold losers too long. Easy to use, low cost, mathematically based habits and routines help protect against negative emotions and impulse investing. Take control of your investing. Make decisions based on data and discipline, not gut feelings. The Purposeful investing Course (Pi) teaches math based, low cost ways to diversify in good value markets and in ETFs that cover these markets. This course is based on my 50 years of investing experience combined with wisdom gained from some of the world’s best investment managers and economic mathematical scientists. Pi’s mission is to make it easy for anyone to have a strategy and tactics that continually maintain safety and turn market turmoil into extra profit. One secret is to invest with a purpose beyond the immediate returns. This helps create faith in a strategy that adds stickiness to the plan. Another tactic is to invest with enough staying power so you’re never caught short. Never have to sell depressed assets during periods of loss. Lessons from Pi are based on the creation and management of Model Portfolios, called Pifolios. The success of Pifolios is based on ignoring economic news (often created by someone with vested interests) and using financial math that reveals deeper economic truths. One Pifolio covers all the good value developed markets. Another covers the emerging good value markets. This is a complete and continual study of almost all the developed major and emerging stock markets. This mathematical analysis forms the basis of a Good Value Stock Market Strategy. The analysis is rational, mathematical and does not worry about short term ups and downs. This strategy is easy for anyone to follow and use. Pi reveals the best value markets and provides contacts to managers and analysts and Country Index ETFs so almost anyone can create and follow their own strategy. As you can see in this image (click to enlarge) the top performing Pifolio we are tracking is the State Street Global Advantage Pifolio was up 43.15%. Here is the breakdown of that current Pifolio. Learn how to invest like a pro from the inside out. State Street is one of the largest fund managers in the world and their Global Advantage funds invest in good value shares in good value markets. In the updates we review each portfolio, what has been purchased and sold, why, the ramifications for high risk, medium risk and low risk investors. Don’t give up profit to gain ease and safety! 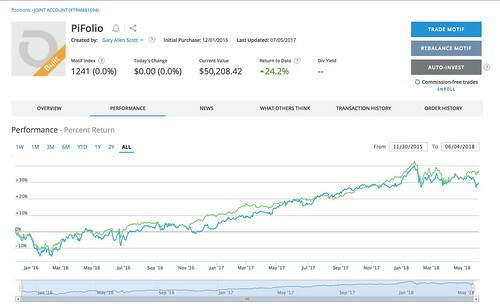 This portfolio has outperformed the US market (S&P 500) in 2017 as the chart below shows. My portfolio blue. S&P 500… green. Regardless of economic news, these markets represent good value and have been chosen based on four pillars of valuation. When you subscribe to Pi, you immediately receive a 120 page basic training course that teaches the Pi Strategy. You learn all the Pi strategies, what they are, how to use them and what each can do for you, your lifestyle and investing. Plus get the $39.95 report “The Silver Dip 2018” free. I have updated this report and added how to use the Silver Dip Strategy with platinum. The “Silver Dip 2017” report shares the latest in a series of long term lessons gained through 40 years of speculating and investing in precious metals. I released the 2015 report, when the gold silver ratio slipped to 80. The ratio has corrected and that profit has been taken and now a new precious metals dip has emerged. I have prepared a new special report “Silver Dip 2018” about a leveraged speculation that can increase the returns in a safe portfolio by as much as eight times. This year I celebrated my 50th anniversary of writing about global investing. Our reports and seminars have helped readers have better lives, with less stress yet make fortunes during up and down markets for decades. 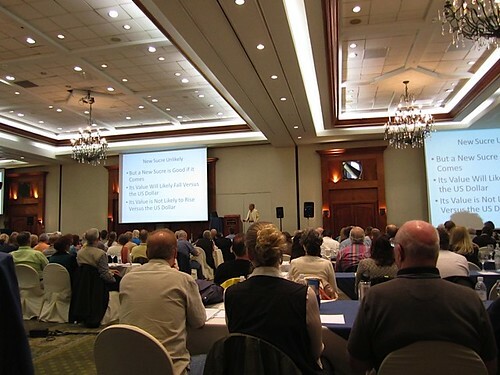 This information is invaluable to investors large and small because even small amounts can easily be invested in the good value shares we cover in our seminar. Subscribe to the first year of The Personal investing Course (Pi). The annual fee is $299, but to introduce you to this online, course that is based on real time investing, I am knocking $102 off the subscription. Plus you receive FREE the $29.95 report “Three Currency Patterns for 50% Profits or More”, the $39.95 report “Silver Dip 2018” and our latest $297 online seminar for a total savings of $468.90. Subscribe to Pi now, get the 130 page basic training, the 120 page 46 market value analysis, access to over 100 previous Pifolio updates, the “Silver Dip 2018” and “Three Currency Patterns For 50% Profits or More” reports, and value investment seminar, plus begin receiving regular Pifolio updates throughout the year. Almost 50 years ago one of my client’s, a top foreign service officer at the US consulate in Hong Kong, approached me. A quick investigation revealed a sad fact… he was being scammed. I warned him, “Avoid it like the plague” and laid out exactly how the broker (aka con artist) would relieve him of his entire $10,000. Later he told me… with some embarrassment, that he had made the investment anyway. He lost it all. $10,000. Just as I had warned. Then he dropped a bombshell. He had invested another $10,000. The broker convinced him the loss was a fluke and he could get his money back. He lost that as well… in exactly the same way. The whole deal was a bit nefarious. This is the con artist’s trick… make the deal a bit outside the law. He could not even file a complaint. This was the perfect scam. The client knew exactly what would happen, but did it any way. Because the investor was desperate… to make more profit. This leads me to three warnings about Wall Street. Before I share these warnings let me add one more thing. 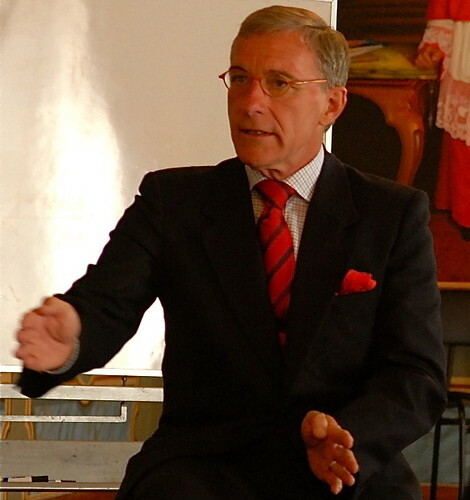 That client convinced me 50 years ago, that no matter what I write… no matter how much I shout… regardless of the logic… not everyone will listen. Fair enough. I might be wrong. Why listen to me anyway? Instead I ask you, consider these beliefs I have developed over the past 50 years of my global investing. No one knows when the super heated US stock market will begin its next bear trend. But a bear will again descend on Wall Street. The autumn and winter months ahead are a likely time for the crash to begin. Yet we cannot be sure. We can still see profits and growth in US shares and we will… until we won’t. The volatility quotient of the DJI is about 10%, so at 22,800, a volatility stop loss should be around 20,500. The trend is bullish so the trend won’t really break until the DJI drops below 21,500. Below 20,500, the risk of a crash is very high. At 20,500, hedge or get out. Do not delay. That a sudden crash can take happen in minutes, even tomorrow… or this afternoon or any day. This warning is not about the market… because equity markets, as rigged as they are, ultimately are rational. The warning is about ourselves… our fears. our dreams. our desires. Our weakness is the urge to invest irrationally in a rational market. That is why we can see a warning in the Wall Street Journal article “Income Investors: It’s OK to Be Sad, But Don’t Get Desperate” (1). This article warns that markets will ignore your needs. The article says: Old bull markets don’t produce new ideas. They just produce new ways for investors to hurt themselves with old ideas. With stocks at record highs and the income on bonds not far from record lows, circumstantial evidence suggests investors are getting restless — if not desperate. Chasing “yield,” or trying to get higher investment income, is one form of desperation. Last month, $1.6 billion in new money poured into exchange-traded funds holding high-yield corporate bonds, according to FactSet. The article explains how a survey of investors found that they “need” returns of 8.5%. Since 1926, the return on U.S. stocks after inflation has averaged about 7% annually. What return do you really need? Markets do not care what you want or need it to do. 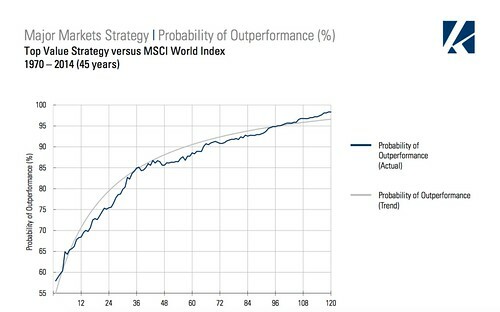 The desire for unrealistic returns can prompt us to take dangerous risks. Just about any get-rich-quick story looks good, as it did for my client in Hong Kong, 50 years ago. A symptom of an overheated market is when desperate investors are willing to buy blindly without knowing when or whether they will be able to sell. The US market is at this point. There is another warning in yesterday’s Wall Street Journal article “Junk Bond Boom Reaches Far Corners of the World” (2). This tells how frenzied buying of risky assets predicts market turning points. (underlines and bolds are mine). The article says: Investors’ thirst for income is enabling governments and companies in some of the world’s poorest countries to sell debt at lower and lower interest rates. And the global bond boom has even reached Tajikistan. Tajikistan’s bonds were rated B- by S&P, six notches below investment grade. The ratings firm estimated the country’s per capita gross domestic product at $900, putting it among the lowest of the sovereign nations it rates, but said it sees Tajikistan’s growth prospects improving gradually. The central Asian country last month raised $500 million in its first-ever international bond sale, paying just 7.125% in annual interest on the debt after the U.S.-dollar offering drew a swarm of American and European buyers. Greece, which was on the brink of default a few years ago, issued new bonds this past summer, and the National Bank of Greece launched a bond sale Tuesday, marking the first visit of a Greek bank to the credit markets since the country’s sovereign-debt crisis. And June saw the bond-market debut of the Maldives, a tiny nation in the Indian Ocean that raised $200 million in a sale of five-year bonds with a 7% coupon. The euphoria is worrying some investors, who warn that frenzied buying of risky assets sometimes presages market turning points. A third warning, also from the Wall Street Journal, shows that even junk bonds are not risky enough for many investors now. The article, “Watch Out As Risky Loans Overtake Junk Bonds” (3) outlines how even riskier floating interest rates make loans attractive to investors but could cause pain down the road. The article says: Yield-hungry investors have made borrowing easier than ever for riskier companies. One sign: this year loans have raced ahead of bonds as the preferred form of debt. But when interest rates rise, this preference could mean trouble. The very thing that is attractive to investors will become a big problem if interest rates rise sharply. For the borrowers, which are mainly companies owned by private-equity firms or others with high debt levels, the costs of servicing their debt will increase, cutting profits, or, worse, creating real cash-flow problems. The stories above provide three signs that Wall Street equity prices could collapse at any time. Remain alert. Short-term trading algorithms can cause market trends to shift at astounding speed. Prepare now what you will do if the markets panic. Create a plan based on math that reveals good value economic data. When the crash comes, stick to your plan. Turn on the auto pilot and normally add to your position. Do not let feelings influence you too much. Use logic and math instead. Seven sentences describe a prime way to get ahead now. Find a way to earn in strong trends created by cycles of war. 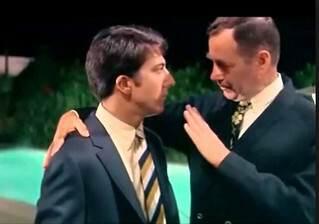 Seven sentences from the 1967 film “The Graduate” with Dustin Hoffman explained a prime opportunity for Boomers in the 1960s. Plastics was the booming growth industry during the early days of the Boomer Era. If that film were rewritten today, the word for “Plastics” should be “Cyber Security”. So, how can we know what’s next? We can get a good idea of what’s next through an understanding of the “Cycle of War”. This is a story that only a handful of economic writers can tell from experience. Just a few, like me, have been writing through the last two two cycles of war. That’s bve=because they have taken almost 50 years. We can see the Cycles of War by looking at this chart of the Dow Jones Industrial Index. The Cycle of War begins when there is a conflict between nations of such urgency that all concepts of return on profit are thrown out the window. Huge resources are thrown at refining new technology to help win the struggle. After the war, the technology shifts from military to domestic use and great increases of productivity are gained. This productivity leads to new fortunes and starts an economic bubble. The bubble overextends and bursts. The burst leads to economic stress and new struggles. Once again R&D accelerates and leads to new and refined technology. The first Postwar Boom probably started in about 1865. 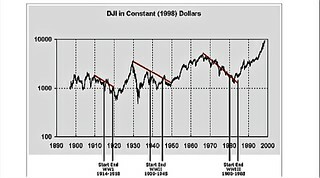 We cannot see this as the chart does not start until 1890. I am guessing the 1865 date because this was the end of the War between the States. This war was a battle over cotton, the primary ingredient used in the water powered industrial revolution, an era dominated by textiles. We can see this boom carrying on up through 1900. The battles were fueled by steam power. After the war, building railroads led to unimaginable wealth and affluence. The stock market was turned into a bubble by the robber barons. The next fifteen years downwards cycle began in 1900 a downfall leading to WWI in 1914. WWI was fought with the internal combustion engine. At the end of WWI, we see the next post war boom fueled by the automotive industry which runs up to 1929. Then the next fifteen years down cycle ran from 1929 to 1945. WWII brought numerous new technologies, including TV, radar, jet engines, nuclear power, fertilizer and plastics. These technologies introduced into the domestic economy created the largest postwar boom ever, from 1946 through 1968 once again followed by a fifteen year downfall. 1968 begins the next 15 year downwards cycle which was the run up to WWIII (Reagan-Thatcher versus the Evil Empire). There was no shooting in this cold war, but the struggle between the East and the West helped lead to the computer and internet. These big technologies evolved and kicked off a post war boom that ran for about 15 years until the .dotcom crash that began in 1999. The “Cycle of War” theory suggests that WWIV has begun. We should ask “Where is WWIV?” What struggle is so intense that it will lead to a new disruptive technology that will change everything? That struggle could well be over Cyber Security. There are two economic factors so important to the world that if disrupted, the global economy could collapse. Banks would close. Stock prices would plunge. Even Social Security could stop. Stores shelves would be empty if we could even get to the store. Traffic will dwindle as gas pumps run dry and America’s highways will become eerily quiet. The two factors are globalization and networking. Consumers everywhere are almost entirely on global trade and on the convenience created by computerized networks. Everything we do, from getting electricity to a phone to the internet is based on a structure of easy, instant, free networking. Our affluence, even our day to day existence is dependent on global trade, computers and the internet. However, there are several risks that this vital system faces every day. The first risk is an EMP attack. A solar geomagnetic storm could cause the catastrophe. Such a storm occurred in 1859. Known as the Carrington Event it caused telegraph systems all over Europe and North America to fail. Some telegraph operators received electric shocks. Telegraph pylons threw sparks. In 1989, a minor storm of this nature left six million people without power in Eastern Canada and the U.S.
A solar storm in 2012 was equal to the 1859 deluge but missed the Earth by a narrow margin of approximately nine days. The region that produced the outburst was not pointed directly enough at Earth to create devastation. Economic existence as we know it was saved. Had this storm hit the Earth, it is likely that it would have inflicted serious damage to electronic systems on a global scale. A 2013 study estimated that the cost to America alone could have reached nearly three trillion dollars and the recovery time would have been up to ten years. The solar storm next is unpredictable. An electromagnetic pulse triggered by a terrorist A-bomb, is also capable of disabling every unprotected computer in America or China or Europe. 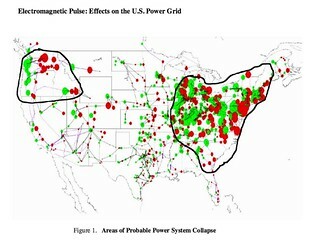 The US Federal Energy Regulatory Commission (FERC) report “Electromagnetic Pulse: Effects on the U.S. Power Grid” (12) says “HEMP (high altitude EMP) is produced by a nuclear weapon detonated above the atmosphere. No blast, shock or radiation is felt at the Earth’s surface; however, electromagnetic fields do reach the surface. One scenario is known as a Scud-in-a-Bucket where a rogue state shoots a short range missile – a Scud from a fishing boat (the bucket) in US waters. A single nuclear bomb exploded over the Midwest, if high enough could generate an electromagnetic pulse that would destroy every unprotected chip in the continental USA. North Korea’s rocket launch from the Sohae site is ominous. This leaves numerous countries open to attack-no boat required. Japan, the world’s third largest economy, is especially vulnerable. China and South Korea are is at risk as well. Europe has a different risk, being close enough to Iran and other radicals in the Middle East. If any of the big economies lose their communications and computer infrastructure, panic will begin. Our system today succeeds because the economy is global and connected. Break any one link and the entire chain will pull apart. That EMP, by the way may not come from an enemy, but an error. In 2013, a secret document, published in declassified form, was published by the Guardian newspaper. The report revealed that in 1961 the US Air Force came close to detonating an atom bomb over North Carolina that would have been 260 times more powerful than the device that devastated Hiroshima. Two bombs were released from a B52 in trouble and three of the four safety mechanisms in one bomb failed. More likely… a hack attack. Solar flares or bombs could cause a breakdown, but hack attacks are taking place every day. This war is on. This risk is so great that the US air force has created a functional Cyberspace Security and Control System as a weapon just to provide 24/7/365 Department of Defense Information Network operations and provide defensive cyberspace operations (DCO) within those Air Force Networks. This weapon has been deployed to Air Force bases worldwide. New Hacking Technology will eventually change everything for sure. Even without attacks by nature or mankind, the electronic era, as we know it, is dead. Do not doubt this. The question is not if, it’s when. The battleship was a predominant power in WWI. Submarines and airplanes changed that. Aircraft carriers became a predominant power instrument in WWII. Missiles changed that and are currently a predominant power. The quantum computer will soon change this and anything and everything we know about the modern computer driven world. This quantum shift may surprise us sooner than we realize. There has been surprising progress in building small proof-of-concept quantum computers in the last couple of years and when cryptography is defeated internet security as we know it will end. MIT reports that a tiny startup company is racing Google to build quantum computing chip by the end of 2017. The chip is significantly more complex than those built by other groups. Another startup called D-Wave has already sold a chip with more than a thousand qubits to clients including Lockheed Martin and Google. The race to beat the quantum chip, or any of the attacks will put the world into “disruptive innovation” shock. Imagine what happens when passwords and algorithms are no longer secure. Anyone with the right computer can grab your money. Rockets can be redirected back to their owner. Airplanes can be stopped… mid air. Control over computers and the internet will be a thing of the past. These risks might sound improbable, but for almost 50 years I have watched economic dependence on global connectivity grow. The change to computerized connectivity has dramatically increased productivity, but for this technology to work, everyone has to be connected. This increased productivity has led to increased spending and borrowing, an entire house of cards built on a system that has one huge flaw. The flaw is security. The growing expansion has been stretching and stretching at the fabric of our economic walls. All that holds it together is the mud and cement of confidence. One single break in this dam can cause a complete rending that is almost instantaneous. If computers and/or the internet stop, for even a few moments, a global stock market and financial meltdown can come in just days, maybe even hours. More likely, instead of total disintegration, we’ll see a sudden drop in wealth, a significant lowering of standards in the middle class and a wider inequality of income and wealth. The middle class will become much poorer and the wealthy far richer. What is the solution? I do not know. The outcome of such struggles are always obscured by the fogs of war. There is no doubt though that the timing and the way the economy, political system and stock markets are acting, the battles are being fought now. The way to survive and prosper from this scenario is to stay healthy (the health care and insurance systems rely on the internet and computers). Second, invest in value. Third, create a way to earn so if the financial system falters temporarily, you can hold on rather than be forced to sell assets at a loss. Learn how to earn by writing to sell.